There is a better way to receive our newsletter than by email, it's called RSS, Really Simple Syndication. What the heck is that you ask? To put it simply, it's a way to have things such as news feeds and newsletters deliverd to your desktop without the hassel of email. You install an "aggerator" (news reader) on your computer, sign up for the feeds you want and then sit back and wait for them to arrive. Each time they are updated you will get the latest copy. Depending on the program you are using you will be notified when there is someting new to read by either a sound or text ballon from your computer. While this may sound complicated it really is quite simple. What makes it the most difficult is the language. Some computer nerds obviously came up with this whole thing and therefore named everything in "geek speak"! Think of the news feed (RSS) as your news paper being tossed onto your porch. Some of you get a daily news paper and others only get the Sunday edition. Either way you've subscribed to it and it magically shows up on your door step or somewhere in the front yard. RSS is better because it always shows up in the same place, on your desktop. The easiest way to get started is to install a reader on your computer. There are a number of programs out there to choose from. We think Awasu is one of the easier ones to get started with. It installs easy and has plenty of features to get you going. You can down load Awasu at www.awasu.com/download.php. Currently it's a free reader (1/9/04). Once the reader is installed you can start signing up for feeds. On many web sites you will now find an XML button that looks like this, . If you click on it you will get a web page that looks like a bunch of computer code which is exactly what it is, XML code. Instead, "right" click on it and a selection box will open up. 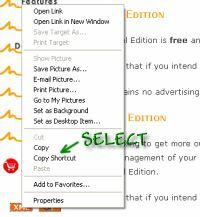 Select "Copy Shortcut" and the link to the RSS page will be coppied to your computers clipboard. Now open your reader program. With Awasu select "File" on the toolbar then "New Channel". Other readers my just have a box at the top for the link. In Awasu you get a window that asks where the RSS feed comes from. "Right" click in the box and select "Paste". It should look something like this. Click the "Next" button and follow the prompts on each of the following pages. On the third page you can select how often the reader should go out and check for an update. For our newsletter once a day would be fine. Or if you only want to down load it on say Saturday you could say once a week. Either way it will not upload anything until there is a new copy for you to read. It should look something like this. All this computer stuff is confusing but with a little patients is really not all that difficult. 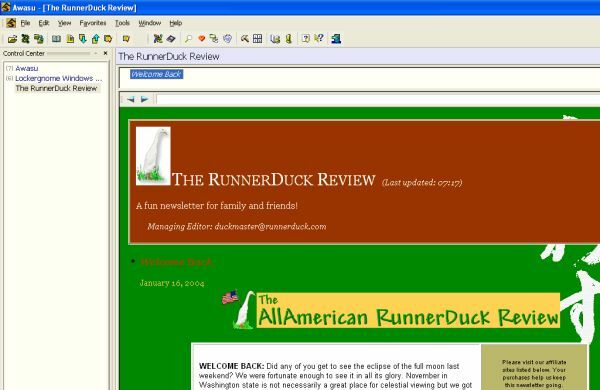 If you have any questions about getting the RunnerDuck newsletter to run in a news feeder just drop us a line and we'll try to help you out, rsshelp@runnerduck.com.